For many years Gilbert confused residential growth with economic development. For every new house that was built we collected fees. For every house built we had to provide: roads, sewers, fire hydrants, parks, police protection, courts, clean water, libraries, and fire stations. Simply not Economic Development. Ten Million Square Feet of new Commercial Buildings. When I hear the current Mayor and Council measuring economic development in terms new housing starts, I worry about our future . They have ignored Gilbert's voter approved General Plan and are rezoning our precious commercial property to allow building of apartments. 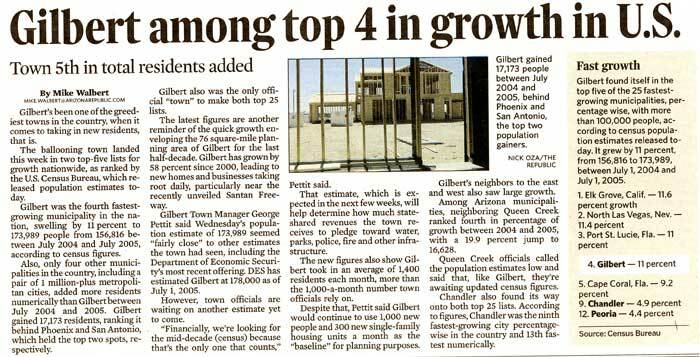 It is bad enough they have not brought a single major employer to Gilbert since I left office. What is worse, showcase employers like Infusionsoft, are leaving Gilbert and building new facilities in Chandler. It's not too late to get back on the winning track: I know how to do it, I've done it before.